Sambar sadam recipe with full video, stepwise pictures. Tamil nadu style sambar sadam, an one pot meal with mixed vegetables, small onions. When I posted keerai poriyal recipe, the background item ‘sambar sadam’ was catchy to some of you. Special effort from Sharmi to post this recipe for sambar sadam,as she always asked me to post it soon and if I ever not post this now,she would squeeze my neck浪.I do nothing special,I almost make similar to arachuvitta sambar and mix it with cooked rice and dal,that’s it. Though I have used fresh ground masala, you can use store bought sambar powder or the sambar powder we use on everyday cooking also can be used. Use 1 tbsp of sambar powder. Cook dal and rice separately or together as per your convenience. Asafoetida, ghee plays main role in flavour of this delicious sambar sadam. Cook vegetables, small onions until soft. After adding the gravy, take care not to mash the vegetables. Cook rice and dal, extract tamarind juice and keep aside. I cook rice and dal separately as I do not like rice get mashed too much(which will happen if we cook together rice and dal). So If you want you can cook both together too. Heat kadai and roast to golden brown,the ingredients under ‘To roast and grind table’ with a tsp of ghee/oil except coconut. Roast coconut separately. Cool down and grind to coarse powder or paste with little water and keep a side. Heat kadai and temper with the items given under ‘to temper’ table. Add curry leaves followed by onion,slit green chillies and fry till the onions start to turn golden. Add the tomatoes and fry till soft.Add the tamarind extract,bring to boil. Add the turmeric,sambar powder,asafoetida and the chopped veggies. When the vegetables get cooked,add jaggery,the ground sambar powder and bring to boil. Add the sambar powder gradually while stirring,as there are chances of forming lumps.Add this to the cooked rice.I used a pot shaped pressure cooker for making sambar rice. Add the mashed dal and mix well with out mashing the veggies. Add hot water if its too thick. I just mix under low flame for 2 minutes.Let the sambar rice be in a loose consistency. After cooled down, it tends to get thick,so let the consistency be according to that.Top with 2 tsp ghee and coriander leaves. While adding the veggies,add the veggie which takes longer time to cook first, followed by the other veggies depending on their cooking time. I have used both the sambar powder and fresh sambar masala. you can use any of one too, adjust the quantity accordingly. If you want to skip the roasting, grinding part, use 1 tbsp store bought sambar powder (or homemade everyday use sambar powder) Just make sure to add generous asafoetida for flavour. You can temper at the last step too. Cook rice and dal for 5 whistles (water for rice 1 & 1/2 cup- water for dal 1 cup). I usually pressure cook tamarind with little water, kept inside along with dal as shown below. Extract tamarind juice and keep aside. Total tamarind juice 3/4 cup. So adjust water accordingly. I cook rice and dal separately as I do not like rice get mashed too much(which will happen if we cook together rice and dal). So If you want you can cook both together too. Heat kadai and roast the ingredients under ‘To roast and grind table’ with a tsp of ghee/oil except coconut, to golden brown. Add coconut lastly, roast until dry. Cool down and grind to coarse powder or add little water to make paste. Keep a side. Heat kadai with 1 tbsp oil and temper with 1/2 tsp each mustard, cumin seeds. Add curry leaves followed by onion, slit green chillies and fry till the onions start to turn golden. In goes tomatoes and fry till soft. When the vegetables get cooked, salt, jaggery, the ground sambar spice mix. Mix well and bring to boil. Add cooked dal, mashed well. Add this to the cooked rice. I used a pot shaped pressure cooker for making sambar rice. Mix well without mashing the veggies. Add hot water (salt along to balance) if its too thick. I just mix under low flame for 3-4 minutes. Let the sambar rice be in a loose consistency. After cooled down, it tends to get thick, so let the consistency be according to that. Top with 2 tsp ghee and coriander leaves. Serve hot with simply potato chips(best combo) or any other veggie accompaniment. Bisi bela bath is my fave..Urs looks delicious. Yummy. love to eat it with fried appalams/papads. Delicious sambar sadham .love it the first pic a lot. Sambar rice looks delicious and yummy. My fav rice Raji. Pls pass here. Wowwwwwww.. Truly delicious and yummy.. Amazing shots !! Looks delicious..but I am not a big fan of Sambhar saadam.I prefer mixing sambhar and rice on my own..hehe,your sambhar powder recipe looks like a must try. Yapa sami oru valiya post panitiya 😉 supera iruku sambar sadam next time I'll try ur version as its different from mine….Luved the first click very much!! Sambar sadham looks mouthwatering! Tempting clicks! I too made keerai poriyal and still to draft! Nanum sigaporeruku shif pannirulama nu pakuren! near ur house. I can't stand this drooling at ur blog pics anymore!! lovely is not enoughto describe! Mouthwatering and flavorful sambar sadham.Your pics are making me hungry all over again. My favourite is Sambhar Sadam with keerai poriyal + appalam. ur sambhar rice is really looking delicious. Never cooked rice and dal separately. will try it next time. Lovely recipe… I like your version..sambar sadam is so tempting..pictures and presentation supera iruku. sadam looks yummy n delicious! perfect poriyal….nice click as usual raji! Nice picture.Yummy rice.I make the same kind of sambar,should mix it with rice like yours.Nice idea. Looks lovely but I do it in a different way. A one pot meal , healthy and delicious. I want that whole looking sambar rice rite now…Truly irresistible and hearty..
Looks so yummy!!! This is my fav!! I love sambhar rice and this looks addictive! Authentic n delicious..love d banana leaf click..
Looks sooo healhy and delicious !! Oh I love sambar rice… infact there is a temple here that serves amazing sambar rice as prasaadham and we always relish it. I always end up making BBB – must try this sometime instead. Delicious and flavorful one pot meal,mouthwatering clicks. 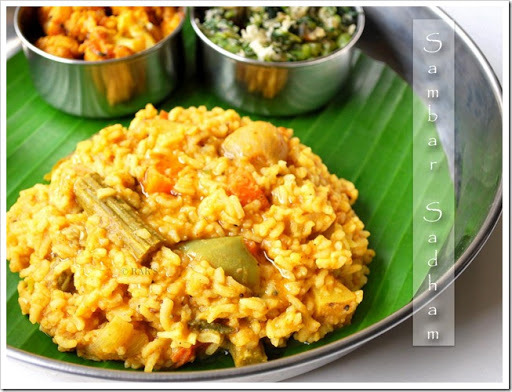 Sambar rice looks so inviting …. I am ready to dig in with a dollop of butter. Amma`s fav,she prefers sambar sadam over Bisibella bhath. I like the presentation especially the first one,gives a nice traditional touch. Delicious spread, @ times, I also make ur kinda Prep, But I cook dhal, rice and veggie's together.. Raks, Loved the first click, feels like am in my home..
Lovely presentation. Bookmarked, Will try and send you the comments. Raks, yummy and delicious sambar rice. Never tried making this before. will try one day…lukin yum. Looks absolutely mouthwatering and lip smacking dish…mmmm…yum..
Yummy…love to have it very hot. First i thought its bisibela bath, after reading post came to know its original tamilnadu syle sambar rice…loved it so much. Please pass me the plate…. after looking at the pic cannot resist. Very tempting Clicks as always:) lovely presentation with sidedishes. sambar sadham looks very nice. i also make it often as it is easy and one pot meal. i cook everything in the same vessel together. Great comfort food, simple, tasty and wholesome! Sambar rice looks just awesome, will try your way next time!!! Looks so inviting.Would love to have a bowl of it right now !!! its too tempting and as usual its awesome.can u tel me wat's the difference b/w bisibelabath and sambar sadham or else both are same. Sambar sadam looks delicious and tempting..
Sambar rice looks so inviting. Nice pics. I love sambar sadam but my son loves BBB 🙂 The only thing, we cook dhal and rice together and make sauce seperately! Looks perfect! My hubby loves sambhar n rice with potato chips very much 🙂 This looks really nicely made, homey n very appetizing ! Sambar rice looks so divine along with the sides .As usual excellent presentation with beautiful pics . Nice recipe on sambar sadam..
wonderful recipe..very healthy and filling one pot dish. This reminds me of a spanish paella. Looks fine and nice to try and see if it will work just right with me. Thanks for your sambar rice recipe:) for past these days i dont know the ratio of coriander so i use to add it wrongly. After seeing your recipe it came out well. Me and my kid loved it. My hubby dont like sambar rice so he didnt. Again thanks for your recipe……Thank you. Hello Raji.. your presentation made me try it and it came out perfectly.. Thanks for the recipe.. Your sambar sadam recipe is too gud…Very tasty with superb aroma..Very authentic as well.. Thanks a lot! Right now i am tasting this sambar sadham (suda suda) which i made it with ur recipe…Very happy 🙂 U rock as always..
Hi, when did you added roasted coconut ? Did you grind it along with other spices ? Pictures looks tempting ! I tried out this recipe.The roasted ingredients gave an extraordinary flavor..especially the grated coconut. To enhance the taste further, you can try adding 2 pieces of cloves while tempering. I am not sure if many will like my suggestion though!